bull market — which turned 10 last weekend, as we discussed here last week. Following that strong rally, a pullback is to be expected; but we don’t think it will get much worse than last week’s 2.1% drop, for reasons discussed below. Though earnings growth is slowing, economic growth supported by fiscal stimulus, expansionary manufacturing surveys, and solid labor markets point to another year of record profits in 2019. Historically, corporate revenue is correlated with GDP plus inflation (or nominal GDP), which could approach 5% this year, if our forecasts are accurate. History also reveals that peaks in earnings growth — as we experienced in the third quarter of 2018 — have tended to be followed by several years of economic growth and stock market appreciation, which should be reassuring to those who think a now 10-year-old bull market is getting fatigued. Finally, keep in mind that the post-midterm election period has historically produced strong gains — Since WWII, the S&P 500 has never been down over the 12-month period following midterm elections (18 for 18), having produced an average 14.5% gain during those periods. President Trump sees a strong stock market as part of his path to reelection, suggesting this historical pattern may hold. 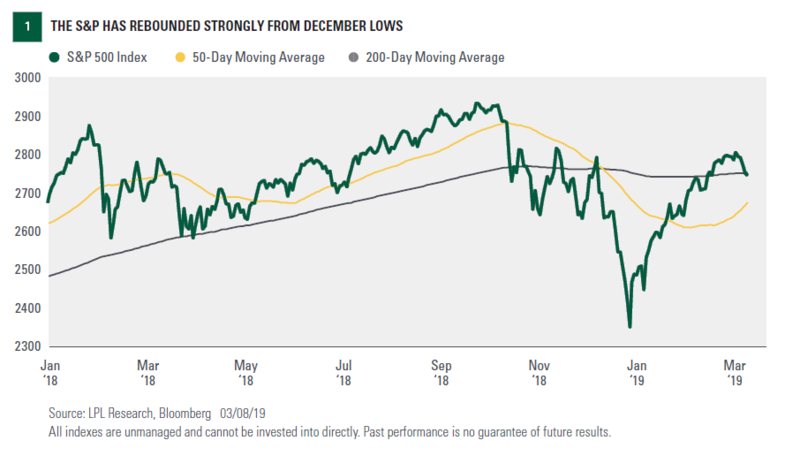 	The S&P 500 is above its upward sloping 50-day moving average (MA), suggesting an improving trend, and at support in the form of its 200-day moving average. 	March has been the second strongest month for the stock market over the past 20 years. 	Stocks tend to go up in the final 10 months of a year (25 out of the last 27 years) after experiencing gains during January and February. 	Market breadth is favorable, with a high proportion of stocks participating in this year’s advance. 	Investor flows have been negative in 2019 — evidence of caution, not euphoria.  Investor sentiment surveys suggest bulls are not in overabundance. 	The percentage of stocks above their 50-day moving averages is still high at 84%, though down from the recent peak of 92%. 	Put/call ratios suggest investors are complacent; more nervousness is typical ahead of rallies. 	The S&P 500 has failed to sustain levels above the 2,800 level four times since mid-October, making a breakout more difficult. 	Support for the S&P 500 below the 50-day moving average is at 2,650, 3.4% below Friday’s closing level. 	The average peak-to-trough pullback after a positive January and February is 9%. Putting all of that together, a 5% or so pullback may be in order. With fundamentals still sound, valuations quite reasonable (discussed here two weeks ago), and the potential catalyst of a U.S.-China trade deal, we would expect additional stock market declines beyond last week’s 2% dip to be fairly modest. Keep in mind that pullbacks of this magnitude are typical — we tend to see three or four of them each year. Weakness may provide opportunities for suitable investors to add equities based on what we see as a generally favorable macroeconomic environment.